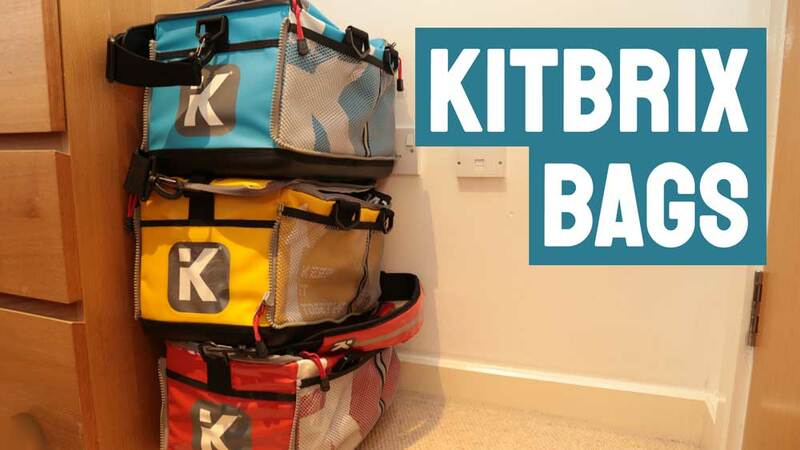 In this video, I’ll review the Kitbrix kit bag. They’re not your ordinary sports bag: instead, they’re constructed like bricks that can be chained together in a long line for transporting loads of equipment. Is that something you need, though? They’re really rugged. They come with a rigid bottom that holds the shape of the bag, and the walls are double lined so that they are way more waterproof than an ordinary bag, or even your waterproof coat. They come with three internal pockets, one of which is transparent for holding paper notes. There are a further four mesh pockets on the outside. The zip is super heavy duty so that it will keep water out and allow you to chain the bags together without fear. This does make it really difficult to use, though. It’s not broken, as far as I can tell, it’s just built to last and this means sacrificing a lot of ease of use. One of the key features of the Kitbrix is that you can take two of the bags and turn them into a backpack. I’ll show you how to do this in the video. The zip is a bit difficult to do, but otherwise the system works really well and I use this every time I go to a triathlon race. Overall, the bag system works really well. Every time I go to a race or cycling sportive I take a couple of them so that I can divide my gear into different sections: pre-race, transition bag, post-race recovery and change of clothes. It is expensive, though. And less convenient than the backpacks and transition bags you can buy. So, it might come down to how light you travel. For me, I travel heavy and these work great.